Glenn D. Ritzenthaler, 89, of Tiffin, passed away Wednesday morning, Sept. 5, 2018, in Mercy Health – Tiffin Hospital. He was born Oct. 7, 1928, in Tiffin, to Harry and Martha (Willet) Ritzenthaler. He married Marta Dysinger Aug. 13,1950, in Washington United Methodist Church, Tiffin. She preceded him in death Feb. 8, 1998. He is survived by his daughter, Lynne Cartwright of Tiffin; two grandsons, Nicholas Cartwright of Put-in-Bay and Brent (Heidi) Cartwright of North Olmsted. He was anxiously awaiting the arrival of his first great-grandchild due in March. He also was preceded in death by his parents and a son-in-law, Kent Cartwright. He was the last of his siblings. His sisters, Jo Ann Barth, Margaret Thomas, Kate Sendelbach, Ardinell Border and Helen Ritzenthaler; and a brother, Don Ritzenthaler, went before him. He graduated from Columbian High School in 1946 and attended Heidelberg College for one year where he played football. 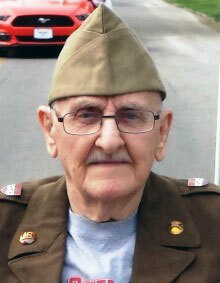 He served two years in the U.S. Army during the Korean War, stationed in Germany. After serving his country, he came back to Tiffin and learned the construction trade from his father-in-law. Together, they built many houses in Tiffin. Using his knowledge of construction, he started volunteering with Seneca County Habitat for Humanity in 1987, building many houses and working well into his 80s. For his service, he was awarded the Habitat for Humanity Golden Hammer Award. He also made summer trips to Kentucky and Mississippi to spend the week working with other Habitat for Humanity chapters. On a trip to Georgia he was honored to meet Jimmy Carter, who still is involved in Habitat for Humanity, and sit in on his Sunday school class. He was an avid sports enthusiast, participating and watching. He played basketball, football and baseball, but would watch anything that used a ball, no matter the color, size or shape. He officiated many football and basketball games in the area, from Little League to varsity. He retired after 29 years of officiating and was inducted into the Ohio High School Athletic Association Hall of Fame in 2006. Because of his work at the local level with young athletes, he was inducted into the Tiffin Columbian Athletic Hall of Fame in 2004. Even in his later years, he remained active in the community. He was a member of the First Presbyterian Church, Tiffin Elks Club No. 94, Tiffin Lion’s Club and Allen Eiry Center. He loved to play cards, make popcorn balls and ride his red scooter in the parades. Family will receive friends at 10 a.m. Wednesday, Sept. 19, 2018, until a celebration of life for Glenn begins at 11 a.m. at First Presbyterian Church with the Rev. Katie Treadway officiating. Burial will be in Greenlawn Cemetery in the Dysinger family plot. Memorial contributions may be made to First Presbyterian Church, Seneca County Habitat for Humanity and Community Hospice Care of Tiffin.